When some go on vacation, they prefer the outdoors and the wide open road as opposed to flying on airliners and staying in hotels. There are many different types of campers on the market that cater to this need, including folding tent campers, travel trailers, fifth-wheel trailers and motor homes. 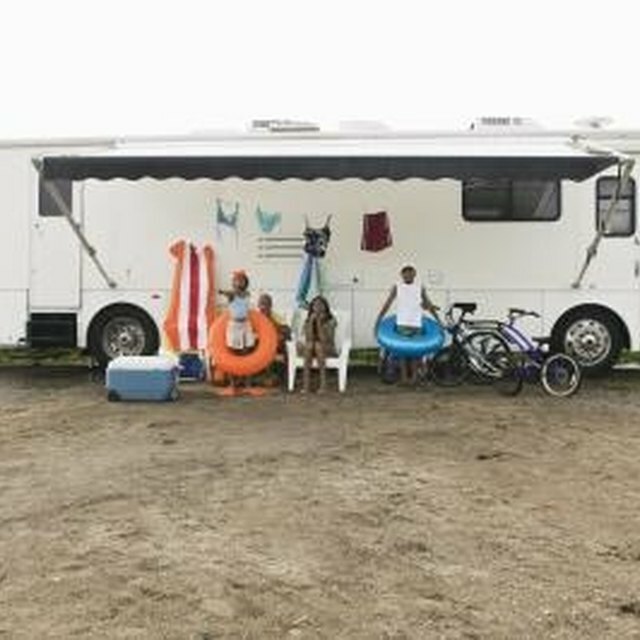 To expand the living spaces of these recreational vehicles even further, an exterior awning may be just the ticket. Knowing how to set up the awning once the camper has been parked will let the fun begin sooner. Locate the round adjustment knob on each of the upright awning supports on the side of the camper. Loosen, but do not remove, the knob on both supports in a counterclockwise direction by hand. Locate the travel locks -- which keep the awning from unrolling while traveling -- on each side of the awning near the top of the camper's roof-line. Use the hooked end of an awning extension wand to flick each of the travel locks upward. Hook the awning extension wand onto the ratcheting lever on one end of the awning and flick it to the "DOWN" position. Place the hook on the extension wand into the looped strap at the center of the awning. Pull the extension wand downward to unroll the awning. Continue pulling down until the awning has been completely unrolled. Fold up the handle on one of the upright awning supports. Lift the support with the handle until the height of the awning is in the desired position. Hold the support in this position and tighten the adjustment knob in a clockwise direction until tight. Fold the handle back down. Repeat this step for the remaining awning support. The awning can be lowered by loosening the support adjustment knobs and lowering the supports to the lowest position. Place the hooked end of the wand in the awning strap to keep it from rolling up on its own, then flick the ratcheting mechanism to the "UP" position. Slowly release the wand and let the awning roll up completely. Tighten the adjustment knobs and flick the travel locks to the downward position. Stow the awning when storms or high wind are in the weather forecast to prevent damage to the awning. How Do I Get a Lazyboy Recliner Handle Off?